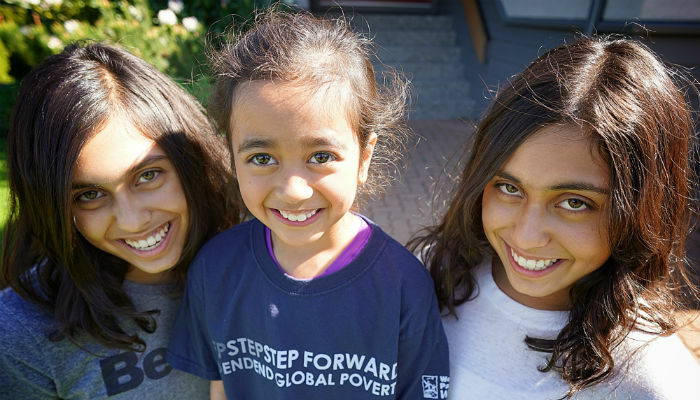 “World Partnership Walk helps to open a door to the larger world.” School Team Captain Shreya Gandhi, Victoria, BC. “We could not imagine that there are places in the world where kids like Sabina don’t have easy access to food, medical treatment, or education. She inspired us to act.” School Team Captain Shreya Gandhi, Victoria, BC. First-time School Team Captain Shreya Gandhi feels it is important that young people in Canada understand the challenges of those living in poorer parts of the world: “We need to look past ourselves, and to a greater purpose,” Shreya said. For Shreya and her sister Riya, World Partnership Walk offers them the opportunity to do exactly that, to look at life beyond their own backyard and to be part of a global movement. “Our hope is to make our peers aware of…all the good that can be done with the funds raised. We’d like to show others how to be part of a solution,” said the sisters. Shreya’s advice to other young people who want to support the Walk and raise funds to fight global poverty, is to be organized and persistent and to take advantage of all the great tools, resources support on hand. When asked what has stuck with them about the Walk, Shreya and Riya pointed to Walk Day 2016 in Victoria. One moment at the end of the Walk gave them a true sense that they are part of a larger movement. Check out the Walks’s 2017 fundraising toolkit for great resources to engage your school, university, college, family, friends or co-works in World Partnership Walk and fighting global poverty. Register for World Partnership Walk today! There’s still time to register for the 2017 Walk as an individual or team and be part of Canada’s largest movement to fight global poverty. Together, let’s show the world that Canada is here for them!